The main reason to holiday in Boston is the city's vast historic importance, being one of the oldest cities in the country and, for many generations, home of the scholarly elite. Boston is dubbed the 'Athens of America' because of its great, cultural, political, and economic influence, as well as being renowned for its superior higher education institutions. A holiday in Boston will appeal to history lovers and cultural tourists who will revel in the plethora of museums, art galleries, libraries, and diverse, interesting neighbourhoods. Visitors can walk the Black Heritage Trail and the Freedom Trail to get to grips with the historic wealth of Boston, and need only wander the hallowed grounds of Harvard University to feel the city's academic energy. Boston may be one of America's oldest cities, but it has a remarkably young population. Something like 75 percent of the population is under 45, ensuring that the city's lofty academic atmosphere is balanced by a vibrant restaurant scene, plenty of good shopping, lots of events and outdoor activities, and a varied nightlife. Although some visitors relish the hot, humid summers, or even the cold, snowy winters, the best time to travel to Boston is in late spring or early autumn (May, September and October), when the weather is warm and pleasant. Autumn is particularly lovely as New England's trees wear their colourful fall foliage. Read more on Boston's Climate and Weather. -Visit the Boston Museum of Fine Arts, which houses one of the world's most comprehensive art collections. -Catch a game at Fenway Park and cheer on the Red Sox with the locals. -Enter a world of technological genius at the renowned MIT Museum. -Marvel at the underwater world of the New England Aquarium. 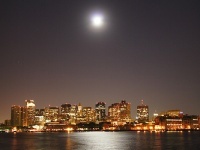 -Tour the Boston Tea Party Ship and Museum, reliving the famous revolutionary event. -Cross the Charles River into the prestigious scholarly enclave of Cambridge. -Shop and eat your way around the Faneuil Hall Marketplace. -Enjoy a picnic and a stroll in the Boston Public Garden, the oldest botanical garden in the US. Popular daytrip destinations near Boston include Salem, famous for its witch trials and historic houses; Plymouth, the landing point of the pilgrims; Gloucester, known as 'America's Oldest Fishing Port'; New Bedford, famous for its whaling history; Lexington, where the first blood of the American Revolution was spilled; and Concord, a charming town loved by many famous authors. Boston Logan International Airport, situated four miles (6km) northeast of the city, is one of the busiest airports in the US, and the primary air travel hub of New England. Get more information on Airports in Boston. -America's first subway, first police department, first library and first public park were all established in Boston. -The Boston Terrier is the official state dog of Massachusetts. -Christmas was banned for 22 years in Boston, by the pilgrims, starting in 1659. As one of the oldest settlements in the USA and the largest city in New England, Boston has a wealth of history and culture to offer. Despite the city's serious academic and historical pedigree, a huge student population ensures a youthful vibrancy that adds a totally different dimension to Boston's bygone charm. Cambridge lies across the Charles River and is the largest college town in the world, synonymous with Harvard University and founded in 1638. The neat, ivy-covered brick buildings of the university grounds, the labyrinth of twisting streets in the city centre, and the old architecture means Boston is best explored by foot. Referring to itself as the 'Walking City', it's remarkably compact and centres on the country's oldest public park, Boston Common. The Information Centre in Boston Common is the starting point for two of the city's main attractions, which are, in fact, walking tours. The Freedom Trail explores the city's revolutionary past and the birth of the modern American Republic, while the Black Heritage Trail highlights Boston's place in black American history and its role in anti-slavery. Boston is an easy blend of historic charm and modern convenience, with a busy street life and beautiful architecture, green parks and gardens, skyscrapers and modern freeways, museums, galleries, and colonial churches. The city is home to the first public library, the first public school and the first subway system in the US. It's the site of the Boston Tea Party that started the Revolutionary War and is the location of the Cheers bar, made famous by the popular TV sitcom. Sadly, both planes which crashed into the World Trade Centre were on route from Boston, with many of those who died being local residents. This tragedy hit the city particularly hard and has only added to the famed patriotism of Bostonians.